Living without hot water is something no one wants to ever have to deal with. 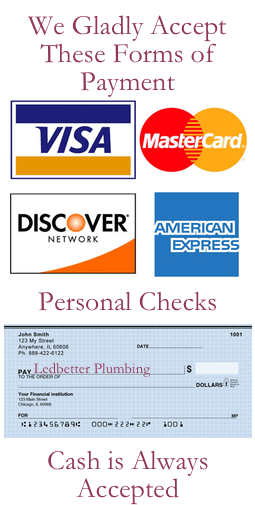 So, if you have a traditional tank water heater that is in need of service, give Ledbetter Plumbing a call. Our licensed plumbers will assist you in any repairs that you may need. 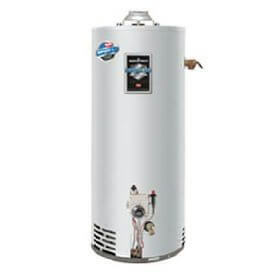 If necessary, we can also give you advice on replacement options if the tank water heater you have need to be replaced. You may have heard about tankless water heaters but never really knew what they are all about. 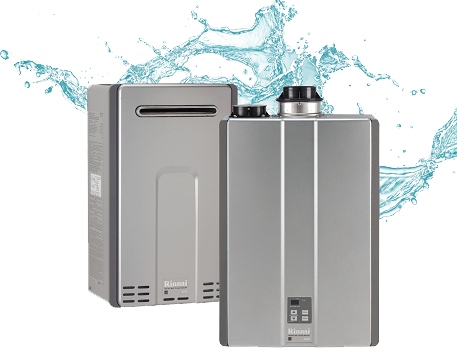 Is a tankless water heater the right choice for you and your family? Let Ledbetter Plumbing help you make the right choice. We will be happy to discuss all of the pros and cons of each water heater system to ensure that you make the proper choice for your home and your budget. You will never have to think about your hot water needs again! As a provider of Rinnai Tankless Systems, we have the unique ability to install and maintain these convenient systems for you. This innovative technology provides an endless supply of hot water whenever and wherever it’s needed – even for simultaneous uses at multiple fixtures. Showers and baths? Absolutely. Laundry and dishes? No problem. Prioritizing activities and scheduling hot water use is a thing of the past. When the need for hot water arises by turning on a shower, washing machine, dishwasher or faucet, cold water enters the Rinnai Tankless Water Heater from the inlet pipe at the bottom of the model. The PC board is then signaled to activate the flame igniter or ignition. A combustion fan turns on to allow oxygen into the burner to ignite the flame as the gas control valve opens at a low frequency.Once an adequate flame is present the igniter stops sparking —beginning the next sequence of operation in a matter of seconds. Water is heated as it passes through the coils of the copper heat exchanger, and exits from the hot water outlet pipe to travel through the pipes of the home or business to the water fixture where hot water is needed. For Condensing models, the water is preheated as it passes through a secondary stainless steel (latent) heat exchanger, capturing any extra heat (or latent heat) before it escapes into the vent system. The gas valve and blower automatically adjust the incoming gas and oxygen to meet the water heating demands. If the demand is small, the Rinnai Tankless Water Heater can use a smaller flame and less gas. If the demand is greater, the flame can expand across the width of the entire burner to heat more water. The tankless water heater adjusts as needed to ensure the temperature set point is maintained. A digital controller allows the user to choose the desired temperature. As the hot water fixture shuts off, cold water stops entering the tankless water heater and the flame diminishes. The combustion fan continues to operate at a low speed for a short period of time. This allows the exhaust of any leftover combustion gases in the system.